Room 2.8m x 4m (Main Room - entered through Right Hand Door on Image Above - the room is an L Shape. 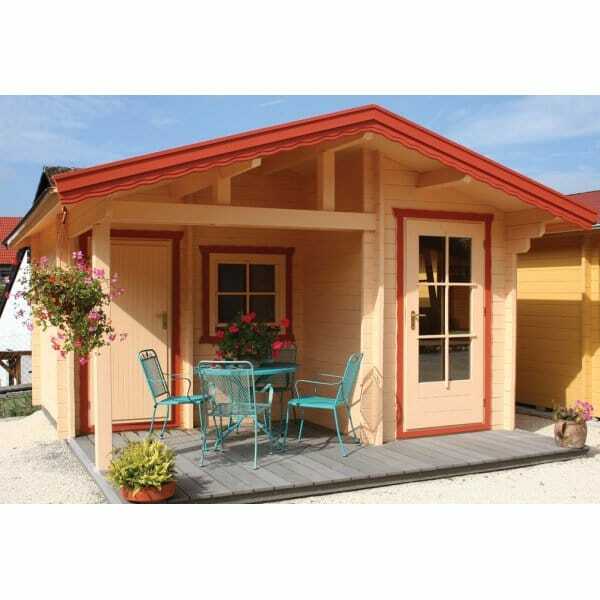 Bertsch Florida: The Bertsch Florida Log Cabin is a striking and versatile building comprising a main room which is in an L shape, and is accessed through Right Hand Door above, and a secondary room area accessed by its own door. The canopy creates a sheltered sitting area, and includes the stunning beamed gable structure as show, which is a useful extension to the main building and can be used all year round. Bertsch are probably Europe's pre-eminent manufacturer of quality log cabins and timber buildings using only the best materials and producing beautiful buildings. Remember : Every building in the Bertsch Range can be altered to suit your garden. In conjunction with Bertsch we are delighted to produce custom made Log Cabins from the ground up!